Vitus, the in-house brand from internet retailing giant Chain Reaction Cycles, offers excellent value by cutting out the middleman and selling direct to customers. You order your bike online and it arrives in a big cardboard box fully assembled. It’s a formula that works really well, and last month the excellent Vitus Sentier 275 VR stomped to victory in our Hardtail of the Year test. We were keen to see if the new 140mm-travel 650b Escarpe was cut from the same winning cloth. Like plenty of other manufacturers, Vitus has redesigned its Escarpe frame to accommodate 650b wheels for 2014. Changes include a shortened head tube to counter the increased stack height of the bigger front wheel and taller fork, and Vitus has also used the opportunity to extend the front triangle to better suit shorter stems (60mm here as standard) and wider bars for a distinctly new-school fit. ISCG tabs on the bottom bracket shell offer extra chain retention options if you need them, and a Shimano 142x12mm bolt-through axle adds stiffness at the rear. The overall shape and geometry of the frame is great, but the frame finishing falls a little short of some others in this test. The air-sprung 140mm-travel RockShox Sektor fork and Monarch RT rear shock are easy to balance front and rear, and together offer a supportive ride, with the Sektor fork performing better than the Fox forks on test, both in terms of sensitivity and control. The Monarch RT shock offers only an ‘open or closed’ lock-out lever and rebound adjuster, but you don’t need any more dials when the suspension is tuned as well as it is here: in open mode we had no desire for extra firmness for anything but long fire-road climbs. The new 650b Easton EA70 XL wheels previously cost £450 in 26in, so there’s no disputing their quality or value. The same can’t be said of the tyres — we were glad to swap out the plastic-feeling Continental X-Kings for our Maxxis control rubber. This change immediately unlocked the Escarpe’s potential and you’ll want to do the same. Elsewhere, Shimano SLX brakes and XT gears with the chain-stabilising Shadow Plus technology equate to the best kit in test, with the bonus of a quieter 2×10 drivetrain with sturdy FSA cranks rather than the noisy triple chainsets found elsewhere. There’s no dropper post included, but you could buy your favourite and still have change thanks to the competitive Vitus pricing. With neutral pedalling and supportive, progressive suspension the Escarpe 275 VRS is very easy to get along with. The stable ride offered by the 650b wheels and long, low geometry with slack angles feels safe and planted at high speed, but the frame does feel a tad less sturdy than the Canyon or GT when you really push it hard. Also, the flipside of the stable geometry and extra length is that the bike can feel a little less urgent and manoeuvrable. Flicky, BMX-ey style riders who like to work the bike around berms and milk the trails for speed may find the overall length of the Vitus a little duller and less playful for things like manuals and sudden direction shifts. Acceleration isn’t the fastest in test either, but the Easton wheels roll quickly and there’s a nice poppy feel to the suspension if you want to pump the terrain to build speed. Rider position is well centred thanks to a short stem (the only one on test we decided not to swap out), and Vitus appears to have done its homework with its four-bar suspension design, as there are no nasty quirks to unsettle balance; it climbs well, there’s good cornering traction and nothing untoward happens under braking even on the steepest sections of trail. 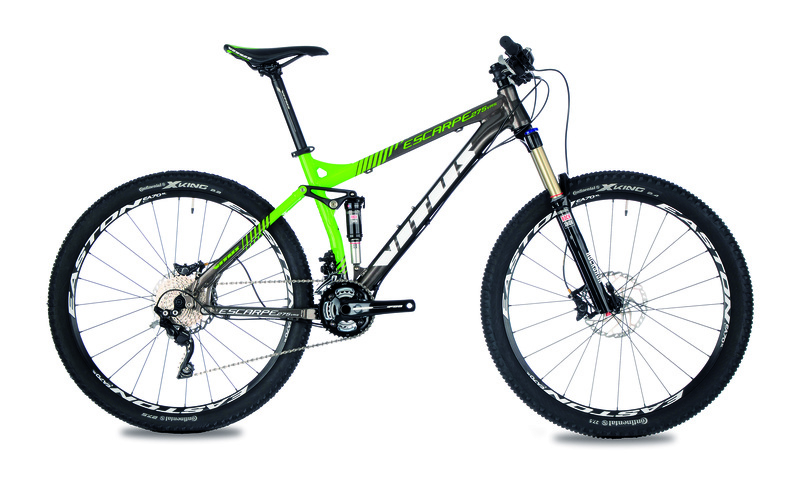 It’s hard to think of a package for this kind of money that offers comparable performance to the Vitus Escarpe 275 VRS. Ride quality is stable and predictable, with no weight penalty despite costing hundreds of pounds less than the competition. With just three size options, however, some riders will fall outside of the range, and if your only focus is all-out fun, then the Vitus might fall a tiny bit short. It more than makes up for it in its versatility, though. From big days out to trail centre blasts, right through to steeper, more technical DH tracks, the Vitus will make light work of them all. You can’t ask for much more for under £1,500. It more than makes up for it in its versatility, though. From big days out to trail centre blasts, right through to steeper, more technical DH tracks, the Vitus will make light work of them all. You can’t ask for much more for under £1,500.